With a proper schedule and campaign using traps baiting and shooting Australian Feral Management can reduce and control the feral pig population in a given area. 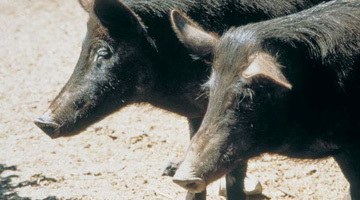 Feral pigs are environmental and agricultural pests. They cause damage to the environment through wallowing, rooting for food and selective feeding. They destroy habitat for native plants and animals and spread environmental weeds. Feral pigs destroy crops and pasture and they could spread exotic diseases should there be an outbreak. Research is continuing into techniques that will control feral pigs and minimise the damage they cause to native plants and animals. Domestic pigs were brought to Australia at the time of European settlement as a food source, and were transported around the country by 19th century settlers. Initially, the pigs that escaped or were allowed to wander were associated with human habitation, but truly feral colonies eventually became established. Their spread — mainly along watercourses and floodplains — is not well documented, but by the 1880s feral pigs reached such numbers that they were considered a pest in parts of New South Wales. Today, between 13 million and 23 million feral pigs are spread across about half of the continent, from western Victoria, through New South Wales into Queensland, and across northern Australia. Isolated populations are found on a few offshore islands.